Kellogg's Research Labs, Standard Temp 115°F (45°C), 0.020"
Kellogg's Research Labs, Standard Temp 115°F (45°C), 0.040"
Kellogg's Research Labs, Body Temp 95°F (35°C), 0.040"
Kellogg's Research Labs, Body Temp 95°F (35°C), 0.020"
Nitinol, also known as Ni-Ti is one of several shape memory alloys available. The shape memory effect comes from the mixture of nickel and titanium transferring between the martensite and austenite phases of crystal structure. Basically, what this looks like is you have a wire that you can straighten, bend into any shape, mash, etc. and then place it in hot water to watch it come back to its original shape. The uses for this are endless. Uses include robotics, heat engines, science projects, practical jokes, artery stents for a bypass surgery, the only limitation is your creativity. Low-temperature activation, medium heat activation, and high heat activation wires in different diameters. 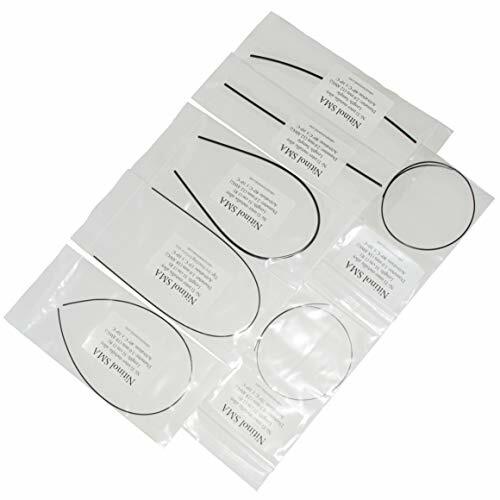 Contents: 1 foot each of 0.5mm 70C, 1mm 80C, 1mm 40C, 1mm 15C, and 2mm 80C nitinol wire and 6" samples of 2mm 40C and 2mm 60C. This will give you a wide selection to experiment with to pick out what works best for your project as each wire exhibits different properties. Yes - it comes pre-trained STRAIGHT from the factory which is how you want it. You can re-train it if you want to take on a new shape. 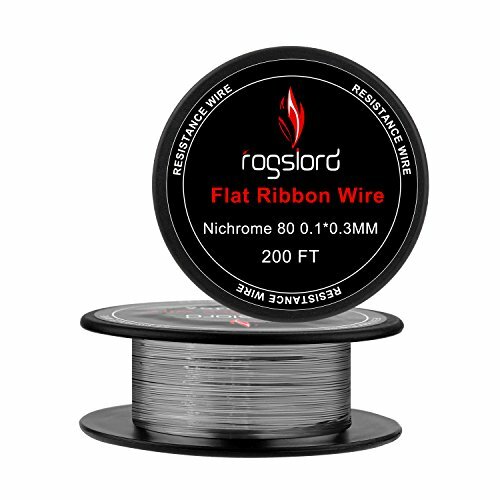 The wire has a lustrous titanium color (dark grey) with a bluish oxide tint on its surface. When freshly cut, the inner core is nickel white. 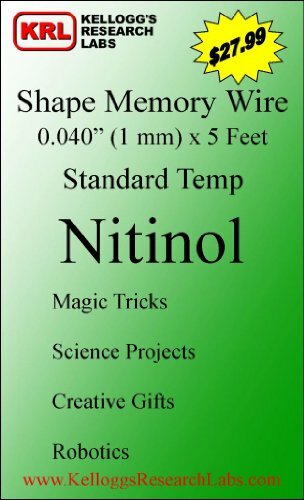 Nitinol is very abrasion resistant and has self-healing properties, so the wire is quite hard to cut and kink. It feels very smooth and shiny to the touch. It does not require any special handling or protections from oxidation or moisture, and is non-toxic. Do not over heat it, as that will damage the property. If you are using electricity instead of hot water to activate it, be sure to use a current limiting circuit. 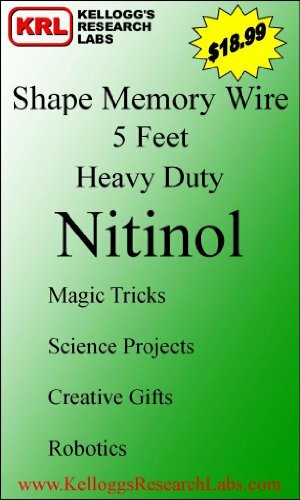 Nitinol, also known as Ni-Ti is one of several shape memory alloys available. The shape memory effect comes from the mixture of nickel and titanium transferring between the martensite and austenite phases of crystal structure. Basically, what this looks like is you have a wire that you can straighten, bend into any shape, mash, etc. and then place it in hot water to watch it come back to its original shape. The uses for this are endless. Uses include robotics, heat engines, science projects, practical jokes, artery stents for a bypass surgery, the only limitation is your creativity. 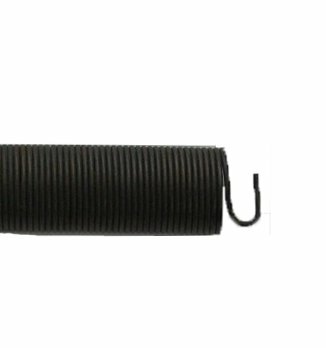 Nitinol springs are shipped as a continuous length to maximize the usability of the spring by allowing the end user to cut the springs to their ideal size--saving both time and money. Nitinol Memory Wire 12" Length x .03"
Nitinol Memeory Wire is a Shaped Memory Effect (SME). The alloy can be made to remember a particular shape. Once a shape has been remembered, the alloy may be bent out of shape. Then returned to its original shape by heating the alloy about it transition temperature. This SME property is used in a toy called Memory Wire. You can bend the Memory Wire toy into any shape you want, then place it in hot water and the wire quickly whips itself back into shape. It is interesting to watch this wire almost magically unfold and uncoil itself back into its original shape. 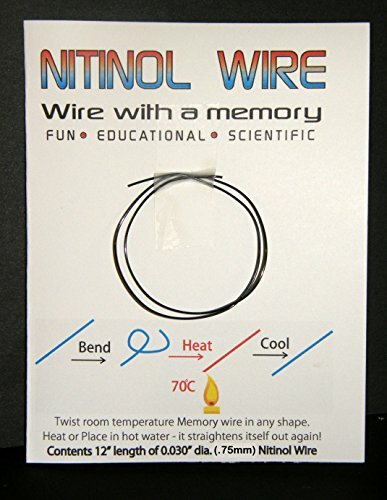 The Memory Wire toy is made of nitinol wire with a low transition temperature (the temperature of hot water). The force generated when the wire is reverting is surprisingly strong. One square inch of Nitinol material generates a shape returning force of + 30,000 PSI. 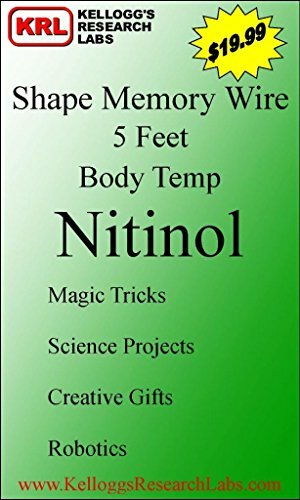 Compare prices on Nitinol Wire at Elevelist.com – use promo codes and coupons for best offers and deals. We work hard to get you amazing deals and collect all avail hot offers online and represent it in one place for the customers. Now our visitors can leverage benefits of big brands and heavy discounts available for that day and for famous brands.